Technology becomes a big thing even for a company famous for its pocket knives. Victorinox, the maker of the popular Swiss Army Knives have tried to come up with new twist to the classic pocket knife that people know. They have added additional features such as a LED white light, a digital clock and even a USB Flash Drive. And in the case of the Victorinox Secure Pro, the pocket knife now features an unhackable memory module for added data security. 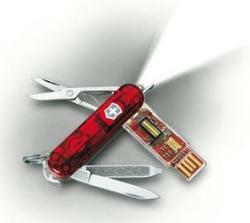 Victorinox Secure Pro is a new Swiss Army Knife that features a flash drive touted to be virtually unhackable. In order to prove its claims, Victorinox even held a contest with a prize amounting to 100,000 UK pounds for the successful hacker that can break into it for a period of two hours which was the duration of its launch event. The prize money went unclaimed. Victorinox has so much confidence on its Victorinox Secure Pro because it provides a number of security features. Its memory stick includes fingerprint ID and a thermal sensor. The memory stick itself is tamper-proof as it contains a self-destruct mechanism that will destroy its CPU and memory chip when any attempts to forcibly open it. The Victorinox Secure Pro has just recently been launched and is available in 8GB, 16GB and 32 GB versions. Prices for the following Victorinox Secure Pro models are set at 100, 145 and 245 UK pounds, respectively.